This entry was posted in GRASS, OSGeo, QGIS on January 8, 2019 by neteler. Thanks to the work of Volker Fröhlich and other Fedora packagers I was able to create RPM packages of QGIS 2.18 Las Palmas for Fedora 23 and 24 using Fedora’s COPR platform. This entry was posted in OSGeo, QGIS on November 27, 2016 by neteler. Go to tab “Network“. Therein, in “Cache settings“, select the “Directory” and choose a folder for the cache files. Be sure that there is free space for lots of megabytes can be stored there over time. And this directory should ideally be located on a fast disk (if you have several). This entry was posted in Blog, QGIS on June 18, 2016 by neteler. Thanks to the work of Volker Fröhlich and other Fedora/EPEL packagers I was able to create RPM packages of QGIS 2.10 Pisa for Fedora 21, Centos 7, and Scientific Linux 7 using the great COPR platform. 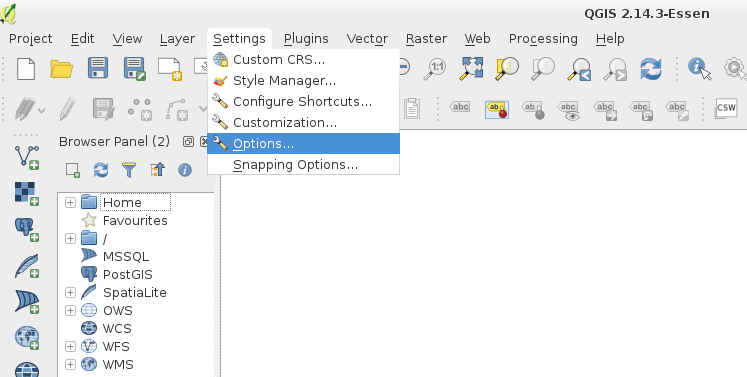 This entry was posted in Blog, Centos, Fedora, GRASS, QGIS on July 29, 2015 by neteler. Thanks to the work of Devrim Gündüz, Volker Fröhlich, Dave Johansen, Rex Dieter and other Fedora/EPEL packagers I had an easy going to prepare RPM packages of QGIS 2.8 Wien for Fedora 20 and 21, Centos 7, and Scientific Linux 7. The base SRPM package I copied from Fedora’s koji server, modified the SPEC file in order to remove the now outdated PyQwt bindings (see bugzilla) and compiled QGIS 2.8 via the great COPR platform. The other packages are optional (well, also qgis-grass, qgis-python, and qgis-server…). PS: Of course I hope that QGIS 2.8 officially hits EPEL7 anytime soon! My COPR repo is just a temporary bridge towards that goal. This entry was posted in Blog, Centos, Fedora, GIS, OSGeo, QGIS on March 23, 2015 by neteler. A visual changelog is available for more details with lots of screenshots. This entry was posted in Blog, FOSS4G, FOSSGIS, GFOSS, OpenSource, OSGeo, QGIS on November 2, 2014 by neteler. We are pleased to announce that the 50th ICA-OSGeo Lab has been established at the GIS and Remote Sensing Unit (Piattaforma GIS & Remote Sensing, PGIS), Research and Innovation Centre (CRI), Fondazione Edmund Mach (FEM), Italy. CRI is a multifaceted research organization established in 2008 under the umbrella of FEM, a private research foundation funded by the government of Autonomous Province of Trento. CRI focuses on studies and innovations in the fields of agriculture, nutrition, and environment, with the aim to generate new sharing knowledge and to contribute to economic growth, social development and the overall improvement of quality of life. The mission of the PGIS unit is to develop and provide multi-scale approaches for the description of 2-, 3- and 4-dimensional biological systems and processes. Core activities of the unit include acquisition, processing and validation of geo-physical, ecological and spatial datasets collected within various research projects and monitoring activities, along with advanced scientific analysis and data management. These studies involve multi-decadal change analysis of various ecological and physical parameters from continental to landscape level using satellite imagery and other climatic layers. The lab focuses on the geostatistical analysis of such information layers, the creation and processing of indicators, and the production of ecological, landscape genetics, eco-epidemiological and physiological models. The team pursues actively the development of innovative methods and their implementation in a GIS framework including the time series analysis of proximal and remote sensing data. The GIS and Remote Sensing Unit (PGIS) members strongly support the peer reviewed approach of Free and Open Source software development which is perfectly in line with academic research. PGIS contributes extensively to the open source software development in geospatial (main contributors to GRASS GIS), often collaborating with various other developers and researchers around the globe. In the new ICA-OSGeo lab at FEM international PhD students, university students and trainees are present. PGIS is focused on knowledge dissemination of open source tools through a series of courses designed for specific user requirement (schools, universities, research institutes), blogs, workshops and conferences. Their recent publication in Trends in Ecology and Evolution underlines the need on using Free and Open Source Software (FOSS) for completely open science. Dr. Markus Neteler, who is leading the group since its formation, has two decades of experience in developing and promoting open source GIS software. Being founding member of the Open Source Geospatial Foundation (OSGeo.org, USA), he served on its board of directors from 2006-2011. Luca Delucchi, focal point and responsible person for the new ICA-OSGeo Lab is member of the board of directors of the Associazione Italiana per l’Informazione Geografica Libera (GFOSS.it, the Italian Local Chapter of OSGeo). He contributes to several Free and Open Source software and open data projects as developer and trainer. Open Source Geospatial Foundation (OSGeo) is a not-for-profit organisation founded in 2006 whose mission is to support and promote the collaborative development of open source geospatial technologies and data. International Cartographic Association (ICA) is the world authoritative body for cartography and GIScience. See also the new ICA-OSGeo Labs website. This entry was posted in Blog, FOSS4G, FOSSGIS, GDAL, Geodata, GFOSS, GIS, GRASS, gvSIG, Mapserver, OpenLayers, OpenStreetMap, OSGeo, PostGIS, QGIS, R-stats, ZOO on October 23, 2013 by neteler. Thanks to Volker FrÃ¶hlich’s efforts, a source code RPM package (SRPM) of QGIS 2.0.1 is now available for Fedora. If you are not yet F20 user (like me), you can just take the F20 package and compile it for F19 (or even F18) since there will be no backport of QGIS 2 to F19 (it comes with QGIS 1.8). But: we do want QGIS 2 on Fedora19! QGIS: Â http://koji.fedoraproject.org/koji/buildinfo?buildID=467757 (–> src – download) or check here for more recent versions. 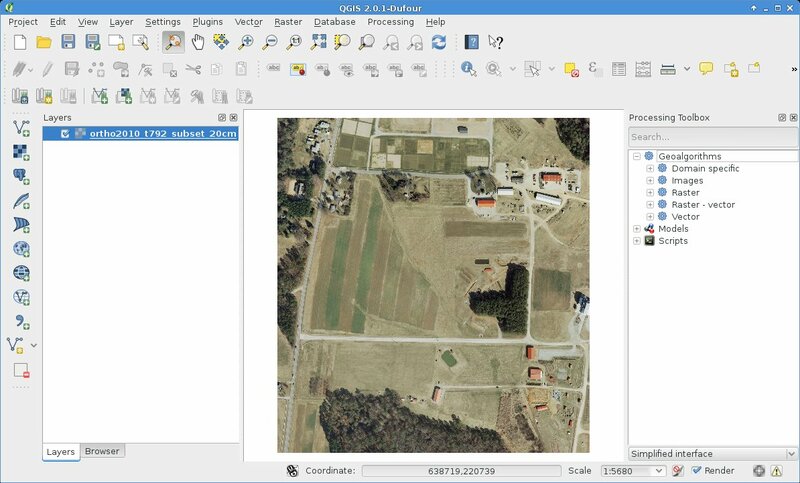 Now we can happily use QGIS 2.0.1 on Fedora 19! This entry was posted in Blog, Fedora, Linux, QGIS on September 28, 2013 by neteler. Support the upcoming GRASS GIS Community Sprint with a (micro)donation! Have you been using GRASS GIS within your company or for your daily tasks? Would like to express your satisfaction and give something back to these terrific software developers to make them even happier during the July’s GRASS GIS Community Sprint in Prague? Sure – so don’t think twice and support the developers with a (micro)donation! Please contact Markus Neteler (neteler@osgeo.org – GRASS GIS PSC Chair) for further details. A “Community Sprint” is a get-together for members and supporters of GRASS GIS and related OSGeo projects to make decisions and tackle larger problems. Developers and contributors are donating their valuable time, so appreciate direct or in-kind funding made available for the sprint meeting to cover out-of-pocket expenses. All of the work that takes place at the community sprint will be directly contributed back into the GRASS GIS project to the benefit of everyone who uses it. See the outstanding results from 2011, and 2012! This entry was posted in Blog, Community Sprint, GRASS development, OSGeo, QGIS on July 9, 2013 by neteler. In my presentation I briefly review 3 decades of Open Source GIS development, from the ’80th to the present. This entry was posted in Blog, Community Sprint, FOSS4G, GDAL, Geodata, GIS, GRASS, GRASS development, gvSIG, Lidar, Linux, Mapserver, OGC, OGR, OpenLayers, OpenSource, OSGeo, PostGIS, Proj, QGIS, Sextante, ZOO on June 17, 2013 by neteler.